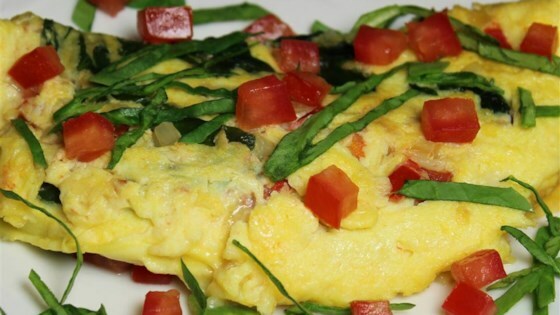 "A wonderful way to spruce up eggs using spinach, mushrooms, tomatoes, and mozzarella cheese." Beat eggs, milk, and a pinch of salt together in a bowl. Heat olive oil in a skillet over medium heat; cook and stir onion and garlic until onion is softened, 5 to 10 minutes. Add mushrooms, spinach, and cherry tomatoes; cook and stir until spinach is wilted, 3 to 5 minutes. Pour egg mixture over vegetable mixture and cook until eggs are still soft and halfway cooked, 2 to 3 minutes. Add mozzarella cheese and Parmesan cheese to egg mixture; cook until eggs are set and cheeses are melted, 3 to 4 more minutes. Season with salt and pepper. I made this yesterday morning. I might add more tomatoes next time. I used a mix of mozzarella, Romano, Asiago, and Parmesan cheeses. Not only is it delicious, but it looks pretty when served. Delicious. I used regular sliced tomatoes instead. They didn’t hold hold together but the presentation was still appealing. What a delicious breakfast and looks so fancy too! Such an easy recipe to add more or less of what you happen to like.